Molly Brooks with a magnum (two bottles worth of liquid) of 11-year-old Riesling. Molly Brooks’ love of wine is as deep as her knowledge. “We joke around in the office that my blood type is Champagne,” said Brooks, the national account manager for Truly Fine Wine, a San Diego wine shop offering sommelier-curated wines from around the world, with a specialty in limited-production German wines. 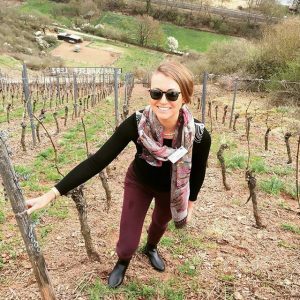 Brooks is also an instructor with San Diego State University’s Business of Wine Professional Certificate program, and shares her knowledge and passion in her class, Intensive: Austrian/German Wines. She answered a few questions about her career, and her course. Growing up, I always wanted to be a history teacher. I was a history buff throughout grade school, received a B.A. in history from Pitzer College [Claremont, CA], and an M.A. in history from SDSU! While paying my way through graduate school working in the restaurant industry, my passion for knowledge transcribed itself into a love for food, beverage, and hospitality — especially the wine part of beverage. I discovered that one could teach people to enjoy wine, and make a living out of that, so I pursued that goal. I managed restaurants and restaurant wine lists for several years, self-educating and obtaining certification from several organizations along the way. 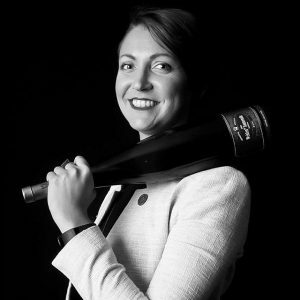 I am an Advanced Sommelier with the Court of Master Sommeliers, WSET Level III with the Wine and Spirits Education Trust, a Certified Specialist of Wine (CSW), French Wine Scholar, and Certified Cicerone (beer professional). I left the restaurant floor in late 2017 to pursue a career as national account manager at Truly Fine Wine, where I oversee retail buying, Wine Club offerings, consumer tastings and events consulting (through our subsidiary VentureSomm), and wholesale distribution for accounts at home and in several other states. I also promote the Pursuit of Gastronomic & Intellectual pleasures through BarWeThereYet, my personal social media account and business. SDSU prides itself on employing well-connected, highly skilled individuals for all of its professional programs and the Business of Wine is no different. I have colleagues who have been teaching in the program for several years, and when a vacancy opened for the German and Austrian Intensive course, I was recommended to SDSU by Jesse Rodriguez, the program’s former teacher. Jesse was moving away from San Diego and, being familiar with my position selling primarily German wine for Truly Fine Wine’s distribution portfolio, as well as being a peer with the Advanced Sommelier certification, he connected me with SDSU’s program directors. I am grateful for the opportunity that was extended last year, and excited to repeat my course this summer! Molly Brooks in a hillside vineyard in the Nahe, in Germany. What are some key takeaways from your course, Intensive: Austrian/German Wines? 1) Learning about wine is FUN! 2) Most German/Austrian wine NOT sweet. 3) Not all German/Austrian wine is white. 4) Once you break the language barrier, you realize that you’re actually getting much more information from a bottle in these countries than almost anywhere in the world! Tasting in class (with spitting), tasting outside of class (spitting not required), “Bottle Reports” — like book reports, but about wine! And repeat-after-me pronunciation games. Do you have a favorite anecdote or historic fact you share with students about Austrian or German wines? The most expensive bottle on the wine list of the Titanic was German Riesling! What do you think are the biggest strengths of SDSU’s Business of Wine program? The program gives students a strong background in the basics of wine, which is necessary to navigate an ever-expanding wine world. I see that the Business of Wine program also fosters a natural inquisitiveness, which is important both in wine knowledge and in the world of business opportunities. One of the most important offerings of the program, however, is less tangible — the people. If there’s one thing I’ve learned about the wine industry — not just in San Diego, but around the world — is that it’s just as much “who you know” as “what you know.” So forging connections with industry professionals and peers is crucial. When I was in my mid-20s, I was at dinner at a swanky restaurant in Vegas. I was familiar, and comfortable with Zinfandel, and luckily that was one of the least expensive bottles on their list — a Ridge “Three Valleys” Zinfandel blend. When the server poured it for me, I tasted it and thought, “There’s so much more to this wine than I’ve ever tasted, and I want to know more!” And so down the rabbit hole I went. I don’t drink much Zinfandel anymore, but I still consider that to be my “Aha!” wine, and Ridge continues to be one of my favorite producers on the planet. Learning! I know a fair amount about this subject, but the laws change all the time, and my classroom is different as well. I learn from my students’ experiences and get to share what I have learned over the years with them. I truly believe that knowledge is power, and the more equipped our community is with knowledge about wine, the better our industry will be, both from an insider’s and consumer’s perspective. 1) Champagne. As a regional style, it’s usually a blend of three grapes: Chardonnay, Pinot Noir, and Meunier (pronounced “Moon-YAY!”). I am drawn to Meunier-driven, bone-dry Champagnes; there is something so “underdog” about them that I can’t help but root for! 2) Dry Riesling with at least 5 years age. That is when great dry Rieslings start to distinguish themselves from one another. Grapefruit-forward, green-herb savory, laser-beams of lemonade, electric chamomile! 3) Birth-year anything. Look, 1987 was not a great vintage in many wine-making regions. Few people made a wine worth holding onto, and even fewer collectors held on for 30+ years. But to me, drinking old wine isn’t just about deliciousness, it’s about history in a bottle, and it reminds me how far I’ve come in that time, too. That I pole-vaulted in high school? I’m a pretty open book. Not enough room here; join me in class!